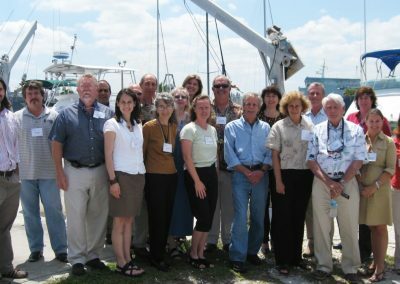 The Southeast Florida Coral Reef Initiative (SEFCRI) Technical Advisory Committee (TAC) was established to provide technical and scientific expertise to all SEFCRI Focus Areas. The TAC is comprised of leading research scientists in the fields of coral reef ecology, water quality, oceanography, geology, fisheries, socioeconomics, resource management, chemistry and biology. Below is a brief biography of each TAC member. If you have questions for one of the TAC members, please email Coral@dep.state.fl.us with the name of the TAC member you would like a response from in the subject and the question in the body of the email. 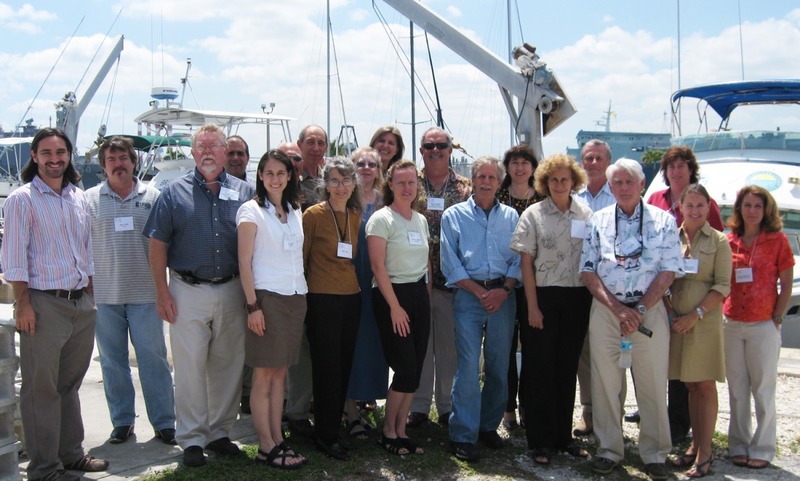 LBSP TAC members at the Spring 2008 TAC meeting held at the National Coral Reef Institute of Nova Southeastern University in Broward County, FL. 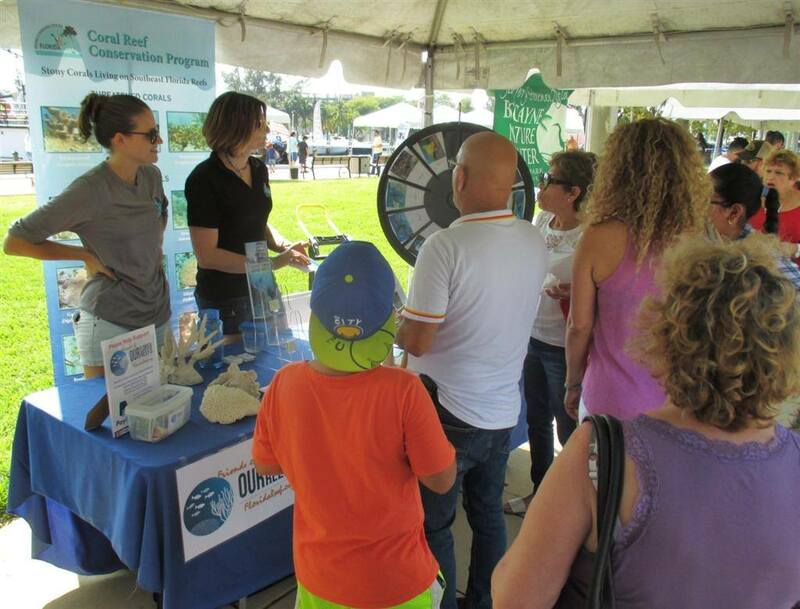 Members of the Coral Reef Conservation Program explain the Southeast Florida Coral Reef Initiative and it’s efforts to members of the community at the Miami River Day. Dr. Ken Banks works for Broward County, in the Florida Environmental Protection and Growth Management Department as the manager of the Marine Resources Program. He is responsible for the management and implementation of interdisciplinary research teams and programs related to coral reef mapping and monitoring (using LIDAR, multibeam and side scan sonars, low altitude aerial photography, and in situ diver mapping techniques), coastal water quality, marine resources damage assessment and restoration, coastal engineering projects (erosion studies, wave and current studies, environmental assessments, and mitigation projects), and coastal conservation. Dr. Banks also helps develop policy for coastal resources management and works with programs including coral reef conservation, manatee protection, sea turtle conservation and environmental restoration. Dr. Don Behringer is an associate professor of Marine Ecology & Diseases at the University of Florida with a joint appointment with School of Forest Resources and Conservation and the Emerging Pathogens Institute. Research in the Behringer lab focuses on marine disease ecology and epidemiology, the resilience and restoration of marine communities impacted by human or natural disturbances, and the ecology and behavior of marine invertebrates. As a Senior Conservation Scientist with The Nature Conservancy (TNC), Mr. James Byrne has expertise in conservation planning, stakeholder engagement, coral reef ecology, coastal restoration, climate change adaptation and applying science to natural resource management. As the former TNC’s Marine Science Program manager, Mr. Byrne provided managerial, technical, and scientific leadership for marine conservation initiatives. These initiatives include work on coral reef resilience, restoration, and enhancing the management of the marine resources that sustain the reef ecosystem and the coastal communities that depend on them. Before coming to South Florida, Mr. Byrne was the Southeast Caribbean Science Director, based in the US Virgin Islands, where he led a team in applying science and technology to coastal and marine conservation issues. He previously led conservation planning and marine assessment for the Grenadines Parks in Peril Program, worked for the NOAA Coastal Services Center’s Coastal Remote Sensing Program, and was NOAA’s Pacific Islands Technical Assistant in Guam focusing on technologies to improve coastal management. Mr. Byrne received his bachelor’s and master’s degrees in marine affairs and policy from the University of Miami. Dr. Nancy Craig is a Natural Resource Specialist with Broward County’s Environmental Protection and Growth Management Department. Her responsibilities include the development and management of programs designed to assess water quality in Broward County’s freshwater and coastal ecosystems. 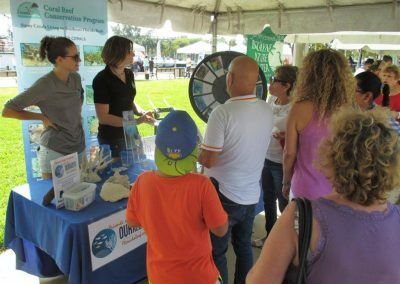 She also works with federal, state, and local agencies, and universities to develop partnerships necessary to effectively manage both inland and near shore aquatic resources. The close proximity of the reefs to heavily developed upstream urban areas increases the risk of exposure to land-based sources of pollution (terrestrial runoff, sewage effluent, etc.). She received a BS in zoology and an MS in biological oceanography from University of Rhode Island. She received PhD in coastal oceanography from the Marine Sciences Research Center, State University of NY at Stony Brook. In both her dissertation and subsequent post-doctoral research, she identified specific feedback mechanisms and trophic linkages between bioturbation and the biogeochemical cycling of organic matter and nutrients in coastal marine benthic communities. Dr. Richard E. Dodge is Dean of, and Professor at, the Nova Southeastern University Oceanographic Center. Dr. Dodge is also Executive Director of the Center’s National Coral Reef Institute which is devoted to providing management research outcomes on reef monitoring, assessment, and restoration. Dr. Dodge received his BS from the University of Maine, and his MS and PhD from Yale University. He is the author of many publications in the scientific literature and reports for various agencies and companies. He has expertise on the effects of natural and man-induced impacts to coral reefs and is well versed in assessing and analyzing effects from physical damage and pollution on coral reefs. This includes experience with sedimentation effects, bomb range impacts, ship grounding damage, adverse effects of oil to coral reefs and coral reef environments, and studies and projects evaluating impacts of coastal construction, development, and LNG ports. His experience includes economic analysis and use of Habitat Equivalency Analysis. Dr. Phillip Dustan, Professor of Biology at the College of Charleston, is a marine ecologist specializing in the ecology, vitality, and remote sensing of corals and coral reef communities. Much of his work has centered on detecting change in coral reef communities. Additional interests include estuarine and riverine phytoplankton ecology, the oceanography of marine mammal habitats, and human influences on marine ecosystem goods and services. He was a founding Principal Investigator on the US Environmental Protection Agency (USEPA) Florida Keys Coral Reef/Hardbottom Monitoring Project responsible for developing sampling design, software, and digital video image analysis for the project. More recently, he pioneered new remote sensing techniques for coral reef change analysis using Landsat imagery, collaborated on developing molecular stress markers for assessing coral health, and developed Digital Reef Rugosity to estimate coral reef spatial complexity. He has worked on reefs in the Florida Keys, Bahamas, Caribbean Sea, Indian Ocean, and Indonesian archipelago. A member of the City of Charleston Green Committee, Dr. Dustan is working to help the City of Charleston reduce its carbon footprint through better capitalizing on natural infrastructure to absorb pollutants, reduce urban runoff, and absorb excess carbon dioxide. Dr. John Fauth is an Associate Professor of Biology at the University of Central Florida in Orlando. He received his BS in biology & chemistry from St. Lawrence University and his PhD in zoology from Duke University, and completed a Pratt Postdoctoral Fellowship at the University of Virginia’s Mountain Lake Biological Station. He teaches diverse undergraduate and graduate courses including ecological methods, evolutionary biology, herpetology, invertebrate zoology, restoration ecology, and vertebrate zoology. His research addresses fundamental questions in ecology, evolution, conservation biology, and restoration ecology, with a special emphasis on freshwater wetlands and coral reefs. Dr. Fauth has conducted coral reef research in Flower Garden Banks National Marine Sanctuary, Florida Keys National Marine Sanctuary, Biscayne National Park, the southeast Florida coral reef tract, and in Puerto Rico, the US Virgin Islands, and Guantanamo Bay Naval Air Station (Cuba). Dr. Gardinali’s research focuses on studies regarding the origin, fate, and transport of anthropogenic organic compounds in freshwater and coastal environments. His group is particularly interested in highly toxic halogenated compounds such as co-planar polychlorinated biphenyls, dioxins, and furans as well as pesticides, herbicides, and polycyclic aromatic hydrocarbons and their metabolites and degradation products in aquatic organisms and soil/sediments. Dr. Gardinali’s group is also involved in the development of analytical techniques for the analysis of trace organic compounds in environmental samples. As an Assistant Professor at Nova Southeastern University Oceanographic Center, National Coral Reef Institute, Dr. David Gilliam’s research interests focus on coral reef ecology as applied to fisheries, restoration, assessment, and monitoring. His projects have strong resource management goals through collaboration with local, State, and Federal agencies. 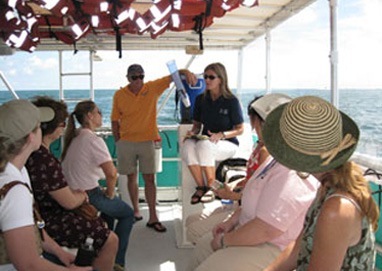 Research efforts include: two long-term Southeast Florida reef monitoring projects, assessing the success of several reef restoration projects, and investigating methods to improve restoration success. He is currently on the Coral Advisory Panel for the South Atlantic Fisheries Management Council. Dr. Gilliam is also an advisor for the DEP and the FWC on reef damage and restoration issues. Dr. Gilliam received his BS from the University of Miami, and his MS and PhD from Nova Southeastern University. Dr. Lew Gramer received his BS in theoretical mathematics from Massachusetts Institute of Technology in 1990 (’90 XVIII-A), and a PhD in meteorology and physical oceanography from the University of Miami’s Rosenstiel School of Marine and Atmospheric Science in 2013. He currently has a joint appointment between the Cooperative Institute for Marine and Atmospheric Studies in Miami, and Keys Marine Lab (under the auspices of the Florida Institute of Oceanography) in Long Key, FL. His research interests include the dynamics of coastal and shelf oceanic and air-sea processes, focusing on processes that directly impact coral reef geochemistry and ecology. Ongoing projects seek to understand the dynamics that dominate sea-temperature variability on reef flats, slopes, and neighboring waters, specifically air-sea and benthic heat fluxes, heat advection and mixing, and associated physical oceanographic processes; to characterize upwelling and cross-shelf circulation on the northern Florida reef tract in order to quantify fluxes of heat, salt, and nutrients onto the reefs; and to develop manager-accessible, high-resolution satellite products for monitoring turbidity in shallow coastal environments, particularly coral reefs within the SEFCRI region. Kurtis Gregg is a fisheries habitat specialist with NOAA Fisheries Service’s Habitat Conservation Division. Kurtis has experience and expertise with state and federal regulatory and natural resource management agencies applicable to the Florida coral reef tract. Mr. Gregg provides additional support to the SEFCRI partnership with expertise in fisheries ecology, partnership building/coordination, land-based sources of pollution, and watershed management planning. Dr. Griffin received a BS in microbiology, a MS in public health, and a PhD with a research focus on the use of molecular methods for detection of water quality indicators and pathogens in aquatic environments from the University of South Florida. In his first post-doctoral position, he worked on human viral detection assays, marine lysogeny and isolation of viruses lytic to the red-tide agent Karenia brevis. In his second post-doctoral position, he worked on a National Aeronautic and Space Administration (NASA) funded grant to study microbiology and public health issues associated with atmospheric transatlantic transport of African dust to the Caribbean and Americas. Dr. Griffin is currently employed by the US Geological Survey as an environmental public health microbiologist and is working on microbial water quality issues, long-range dust storm associated dispersion of microorganisms around the globe and how the geochemistry of soils controls the background distribution of pathogens across the contiguous United States. Dr. Griffin has expertise in aquatic public health microbiology (detection of water quality indicators, pathogenic microorganisms, and microbial source tracking). Dr. Judy Lang, formerly at the Texas Memorial Museum, University of Texas, is presently the Scientific Coordinator for the Atlantic and Gulf Rapid Reef Assessment (AGRRA) Program and a Scientific Advisor to the Reef Condition (RECON) Project. She has had the good fortune to have lived and learned to dive in Jamaica before the near demise of its spectacular coral reefs. She became a reef scientist whose experience now spans coral behavior, taxonomy, biogeochemistry, monitoring, traditional native American knowledge systems, conservation-themed exhibits and public outreach. As the Scientific Coordinator for AGRRA, she helps coordinate a program of representative reef surveys for the wider Caribbean that are based on standardized, measurable indicators of ecological condition. Training, continuing education, and capacity building for participating researchers, managers, and students occupies much of her time. She is also the Chief Curator of the Our Reefs: Caribbean Connections traveling reef exhibits (1996, extensively revised in 2008, update pending) and serves on the Gulf of Mexico Fishery Management Council’s Special Coral Scientific and Statistical Committee. Dr. Diego Lirman, an Associate Professor at the University of Miami’s Rosenstiel School of Marine and Atmospheric Science, is a Marine Biologist working on the disturbance ecology of coastal ecosystems in Florida and the Caribbean. His research approach includes field studies, lab experiments, and ecological modeling. His work is presently focused on: 1) the active restoration of coral reef ecosystems using the coral gardening methodology; 2) the assessment of impacts of Everglades restoration activities on nearshore SAV communities; and 3) the role of Living Shorelines as fish habitat in urban environments of Miami. His lab also participates in the Rescue A Reef (run by the Lirman Lab) and the Key Biscayne (co-developed by D. Lirman) Citizen Science programs. Over the past 20 years, Dr. Lirman has worked on diverse projects to: evaluate the health of seagrasses, macroalgae, and coral reef communities; estimate the impacts of multiple human and natural stressors on these susceptible natural resources; predict the potential impacts of future disturbances on these systems, and develop science-based restoration methods. The research in the Lirman lab at the University of Miami has concentrated on the disturbance ecology of coastal ecosystems. His research includes a combination of extensive field monitoring, laboratory experiments, and simulation modelling framed within an ecological risk assessment protocol to document present-day condition of biological endpoints, susceptibility to stressors, and forecast future status based on simulated disturbance scenarios. Dr. Jose (Joe) Lopez is a Professor at the Nova Southeastern University Ocean Center in Dania Beach, Florida. He earned PhD at George Mason University studying the evolution of mitochondrial DNA and its transpositions in feline nuclear genomes. Dr. Lopez then applied his molecular evolutionary training in postdoctoral appointments characterizing the Montastraea annularis coral sibling species complex at the Smithsonian Tropical Research Institute in Panama, and sponge genetics at Harbor Branch Oceanographic Institute, in Ft Pierce, FL. This allowed him to use submersible technology to investigate deep sea sponges and corals. Since 2007, Dr. Lopez’s research at the Nova Southeastern University Center for Excellence in Coral Reef Ecosystems Science has focused on marine invertebrate-microbial symbiosis, genomics, gene expression of organisms, marine microbiology, metagenomics and systematics, and systematics/phylogenetics, placing marine sponges on a global Tree of Life. He has recently initiated a novel “Global Invertebrate Genomics Alliance” that will coordinate genome sequencing of non-model invertebrate species (http://giga-cos.org) and is also involved with other invertebrate biologists in the global Earth Microbiome Project (earthmicrobiome.org). Dr. Kate Lunz is currently an Associate Research Scientist for the Fish and Wildlife Research Institute Corals Program, and a Principal Investigator for Imperiled Coral Species Research. She received her BS in ecology from University of Georgia and her PhD in biology from University of Miami. Dr. Lunz gained a strong background in coral population and community ecology while conducting coral and benthic macro-invertebrate surveys and assessments across geographical gradients along coastlines of The Bahamas. She was awarded the Smithsonian Institution’s Marine Science Network Postdoctoral Fellowship, facilitating her research on Lyngbya spp. cyanobacterial bloom dynamics in Caribbean coastal and coral reef systems. Dr. Arthur J. Mariano is a full professor of physical oceanography in the Division of Meteorology and Physical Oceanography at the University of Miami Rosenstiel School of Marine and Atmospheric Science. He received BS degrees in mathematics and marine science from Stockton State College and a PhD in physical oceanography from the University of Rhode. Arthur was a post-doc and on the research faculty at Harvard. His research includes ocean currents, Lagrangian dynamics and prediction, ocean modeling, statistical data analysis and assimilation, remote sensing, ocean heat dynamics, and tagging large pelagic fish. He is a member of the NASA Sea Surface Temperature Science Team, SEFCRI Technical Advisory Committee, co-principal investigator of the Consortium for the Advanced Research into the Transport of Hydrocarbons in the Environment, and the co-founder of the Lagrangian Analysis and Prediction of Coastal and Ocean Dynamics group. Arthur is an avid fisherman, the president of the Hollywood Hills Saltwater Fishing Science and Social Club, and speaks at many fishing clubs on the science of fishing and fish tagging. Valerie is Director of the Smithsonian Marine Station at Fort Pierce, Florida. She received her BA from the University of California San Diego with majors in biology and studies in chemical ecology, and her PhD in marine biology from the Scripps Institution of Oceanography. She has served as faculty, director, and professor at the University of Guam Marine Laboratory between 1985 and 2002. Her research interests include marine chemical ecology, marine plant-herbivore interactions, coral reef ecology, and marine natural products. As overgrowth of corals by algae is one of the most troubling conservation issues facing reefs worldwide, she has focused her research on understanding algal chemical defenses against herbivores, in particular, and how these can facilitate algal blooms. She has also studied harmful benthic cyanobacteria blooms because of their increasing abundance. Paul was elected a Fellow of the American Association for the Advancement of Science in 1996 “for significant contributions to the field of marine chemical ecology and for major publications on the effects of secondary metabolites on interactions between marine plants and animals”. Dr. Peters is a full-time Term Assistant Professor in the Department of Environmental Science & Policy at George Mason University, an Adjunct Scientist with Mote Marine Laboratory, and an Adjunct Professor at Nova Southeastern University’s Oceanographic Center. Dr. Peters has taught histology and courses on diseases of corals and other reef organisms and supervises the Histology Laboratory at George Mason University. She studies cell and tissue alterations as a bridge to understanding the molecular and microbiological aspects of disease processes on populations, communities, and ecosystems. She received her MS in marine science from the University of South Florida and her PhD in biological oceanography from the University of Rhode Island’s Graduate School of Oceanography. Her research includes work on contaminant and biota monitoring programs in temperate estuarine and coastal marine environments, as well as tropical coral reef ecosystems in the Caribbean, Florida Keys, and southeast Florida. She is an internationally recognized expert on diseases of coral reef organisms and participates in the Coral Disease and Health Consortium. An aquatic toxicologist and pathobiologist, Dr. Peters’ expertise includes the effects of exposures to chemical contaminants and other environmental stressors on a variety of invertebrates and fishes in both field and laboratory studies. She has performed extensive work on the comparative histopathology of invertebrates. Dr. George Sedberry is Sanctuary Science Coordinator for the Southeast Atlantic, Gulf of Mexico and Caribbean Region of the Office of National Marine Sanctuaries, National Oceanic and Atmospheric Administration. His interests and experience are in the biology, conservation and management of marine fishes, as well as deep-sea biology and coral-reef ecology. Most of his research has concentrated on reefs of subtropical and temperate waters off the southeastern U.S., but he has conducted research on Marine Protected Areas in Belize and Madeira, and on population biology of fishes from the North and South Atlantic, Caribbean and Mediterranean Seas, and the western South Pacific. He was a member of the US National Committee for the International Census of Marine Life, and he currently serves on the Scientific and Statistical Committee (Vice Chair), the Marine Protected Areas Expert Workgroup and the Habitat and Environmental Protection Advisory Panel of the South Atlantic Fishery Management Council. He is an adjunct faculty member of the College of Charleston, Savannah State University and the University of Georgia’s Skidaway Institute of Oceanography, and has authored over 100 publications on marine fishes and ecosystems. Manoj Shivlani is the Program Manager for the Northern Taiga Ventures, Inc. Center for Independent Experts, a program that has organized independent peer reviews of NMFS assessments and products since 1998. He also serves as adjunct faculty at Miami-Dade College and at the University of Miami, teaching undergraduate courses and graduate seminars related to environmental science and policy, international ocean governance, and ocean policy. His research focuses on the human dimensions of coastal and marine resource issues, and he has conducted several projects related to southeast Florida coral reefs, including the socioeconomic impacts of the Florida Spiny Lobster Trap Reduction Program, use patterns of Florida Keys dive sites, user perceptions of the Florida Keys National Marine Sanctuary, characterization of stakeholder groups in the upper Florida Reef Tract, and stakeholder preferences for the management of coral reefs in the SEFCRI region. Mr. Shivlani earned a BA in biology from Colgate University, an MA in marine affairs and policy from the University of Miami, and is completing his dissertation in International Relations at Florida International University. Jack Stamates is a native of South Florida and an Oceanographer at NOAA’s Atlantic Oceanographic and Metrological Laboratory (AOML) in Miami, Florida. The focus of his research has been the South Florida ecosystem, coastal ecosystem health, marine mammal acoustics, acoustical oceanography and oceanic and land-based sources of pollution. Jack is the director of AOML’s Florida Area Coastal Environment (FACE) which is focused on addressing water quality issues within the SEFCRI region. Mr. Stamates is a graduate of Miami Dade College (where he served as an adjunct faculty member), Florida International University, and the University of Miami, Rosenstiel School of Marine and Atmospheric Science. A major emphasis of his work has been in the application of acoustical techniques to environmental research. Dr. Brian Walker is a research scientist at Nova Southeastern University. His research centers on the spatial distribution of organisms, coral reef ecology and geology, reef fish ecology, and landscape/seascape ecology. Of recent particular interest is the effect of latitude and climate change along the northern Florida Reef Tract. He is active in shallow and deep water benthic habitat mapping, habitat impact assessment and restoration, GIS spatial analyses, optical remote-sensing, and hydrographic survey research, particularly LIDAR and sonar-based seafloor discrimination. His research has taken place in the tropical Atlantic and Caribbean including Florida, Mexico, the Bahamas, Puerto Rico, and the US Virgin Islands. Dr. Walker has held many grants and contracts from various agencies, and he has authored numerous publications including technical reports, book chapters, and scientific peer-reviewed publications. His GIS and Spatial Ecology lab houses eight graduate students including three employees whose research includes map accuracy assessment, queen conch distributions, and long-term anchor impacts to coral reef communities. Dana Wusinich-Mendez is the Atlantic and Caribbean Management Team Lead for NOAAs Coral Reef Conservation Program. Dana has been working with NOAA to support the efforts of coral reef resource managers in Florida, Puerto Rico, the U.S. Virgin Islands, and to build capacity for the effective management of marine protected areas in the Wider Caribbean region since 2002. She is a graduate of Duke University’s Nicholas School of the Environment where she focused on marine protected area and cooperative coastal resource management efforts. Prior to obtaining her master’s in environmental management at Duke, Dana worked for the RARE Center for Tropical Conservation and Amigo de Sian Ka’an with communities on the Mesoamerican Barrier Reef System in southern Quintana Roo, Mexico to build capacity for the development and effective management of coral reef marine protected areas.